This is a great go-to recipe when cooking for friends - you can just stick it in the oven and forget about it. For the spice mix, dry fry the coriander and cumin seeds in a frying pan over a high heat for 1-2 minutes, or until fragrant. Grind to a powder with the remaining spice mix ingredients. Set aside. For the lamb, preheat the oven to 150C/130C Fan/Gas 2. Season the lamb all over with salt and freshly ground black pepper. Heat the oil in a large, flameproof, lidded casserole over a medium heat. Add the lamb shoulder and sear for 1-2 minutes on each side, or until golden-brown all over. Remove from the pan and set aside. Add the onions and chillies and fry for 4-5 minutes, or until softened and just coloured. Add the spice mix, garlic and ginger, stir well, then fry for a further 1-2 minutes. Stir in the cardamom seeds, curry leaves and tamarind pulp. Add the chopped tomatoes and stock and bring the mixture to the boil. Reduce the heat until the mixture is simmering, then cover the casserole with a lid. Transfer the casserole to the oven and cook for 3-4 hours, or until the lamb is very tender. Meanwhile, for the Bombay potatoes, boil the potatoes in a pan of salted water for 12-15 minutes, or until tender. Drain well. Heat the oil in a large frying pan over a medium heat. Add the onion, garlic, mustard seeds, chilli powder, ground coriander, ground cumin and ground turmeric and stir well. Add the chopped tomatoes, stir again, then bring the mixture to a gentle simmer. Add the cooked potatoes and continue to cook for a further 4-5 minutes, or until the potatoes have absorbed some of the sauce and are very tender. Season, to taste, with salt and freshly ground black pepper, then stir in the herbs. When the lamb shoulder is cooked, remove the lid from the casserole, baste the lamb with the sauce and cook for a further 5 minutes. Season, to taste, with salt and freshly ground black pepper, then stir in the herbs. To serve, spoon some of the Indian-spiced lamb onto serving plates. 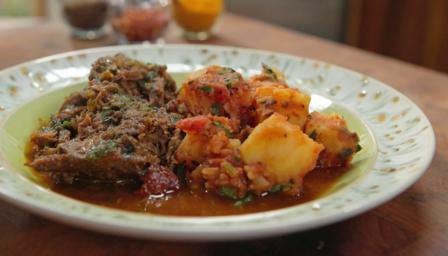 Serve a pile of Bombay potatoes alongside each portion.